Unfortunately, due to sales rights restrictions, we cannot offer Richmond Shall Not Be Given Up for sale in your country. In the spring of 1862, the largest army ever assembled on the North American continent landed in Virginia, on the peninsula between the James and York Rivers, and proceeded to march toward Richmond. Between that army and the capital of the Confederate States of America, an outnumbered Confederate force did all in its feeble power to resist—but all it could do was slow, not stop, the juggernaut. To Southerners, the war, not yet a year old, looked lost. The Confederate government prepared to evacuate the city. The citizenry prepared for the worst. And then the war turned. Federal commander Maj. Gen. George B. McClellan, confident of success, found himself unexpectedly hammered by a newly aggressive, newly emboldened foe. For seven days, Lee planned ambitious attacks and launched them, one after another, hoping not just to drive Federals from the gates of Richmond but to obliterate them entirely. 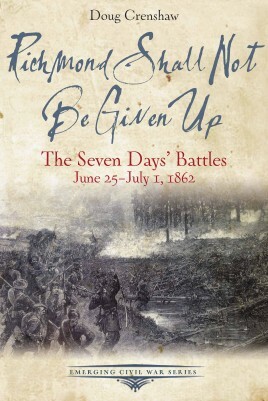 In Richmond Shall Not Be Given Up, historian Doug Crenshaw follows a battle so desperate that, ever-after, soldiers would remember that week simply as The Seven Days. McClellan reeled. The tide of war turned. The Army of Northern Virginia was born.